IDIOT- 1. an utterly foolish or senseless person. 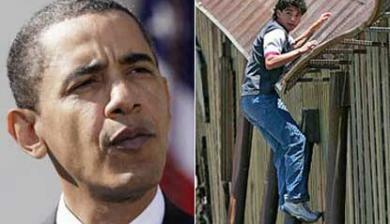 2. a fool, half-wit; imbecile; dolt, dun: MUCHAS GRACIAS PRESIDENTE OBAMA! Judge Blocks Parts of Ariz. Immigration Law. Not Exactly a Victory For Either Side...But a Defeat For Taxpayers..
MUCHAS GRACIAS PRESIDENTE OBAMA! Judge Blocks Parts of Ariz. Immigration Law. Not Exactly a Victory For Either Side...But a Defeat For Taxpayers..
PHOENIX – A federal judge on Wednesday blocked the most controversial parts of Arizona's immigration law from taking effect, delivering a last-minute victory to opponents of the crackdown. NOTE- Thanks to the Obama administration, not only has millions of YOUR tax dollars went towards this ridiculous lawsuit, but BILLIONS more will keep funding illegal immigrants. If 80% of people in this country are for the AZ bill, then they better show up to the polls in Nov and take this Gov't back. Immigration and Nationality Act Article 274A (8 USC 1324a) makes it unlawful to employ unauthorized aliens. INA 212(5)A(i) states " in general any alien who seeks to enter the US for the purpose of performing skilled or unskilled labor is inadmissable unless the Secretary of Labor has determined and certified to the Secretary of State and AG that (I) there are not sufficient workers in the US(II) the employment of such alien will not adversly affect the wages and workers or the US. Then it goes on about pro athletes and actors and such. So 99% of the illegal aliens that are here working, were inadmissable legally, so they come over ILLEGALLY are breaking the law (because 212 also states that even legal immigrants such as visitors and students, are not allowed to work in the US without prior approval. NOW some liberal BS judge says that AZ CAN'T ENFORCE THIS LAW? Obamanation needs to be ousted. "Thanks to the Obama administration, not only has millions of YOUR tax dollars went towards this ridiculous lawsuit,"
It was held up, can't be too ridiculous. Advice to Arizona: Pass sounder law. Maybe give it a little more thought and a little less emotion. I realize it feels good to "stick it" to illegal immigrants. They shouldn't be here, for sure. But there are businesses out there who give them a job and don't care whether they're in the country legally or not, just as long they will work cheap. There's where your anger ought to be. Maybe time for some stiff fines, $100K per illegal immigrant employee. Maybe some jail time.